UPDATED: Mon., March 11, 2019, 10:49 p.m.
LAS VEGAS – Anyone have the guts to get this wager down before tipoff Monday night? It would have been the ultimate hunch play – and yet one anchored in past performance, which would seem to make it two different things. Mostly it was this: unthinkable even a week ago. But now, the motif of Gonzaga’s latest assault on the West Coast Conference basketball tournament is Killian Tillie redux. Or Tillie redux deux, if you prefer. As this is his second go-round on the comeback from injury this season, you’re excused for holding your breath – especially when he takes a nasty fall on a high-flying rebound, as he did Monday night. Or for at least not running to the sports book with outlandish proposition bets. Caution is wise, tempered expectation prudent. Neither are very much fun, however. So when Gonzaga’s multi-faceted 6-foot-10 forward checked into the Bulldogs’ 100-74 semifinal romp over Pepperdine during the first media timeout, the reaction from the Zagcentric crowd of 7,642 was both loud and delighted – it being Tillie’s first appearance on court since he suffered a foot injury in a victory over San Francisco just more than a month ago in Spokane, which ended comeback No. 1. When he spotted up and buried a 3-pointer barely two minutes after his entrance, the arena erupted. And when he made a second – at the end of an artful around-the-horn sequence from Zach Norvell Jr. to Geno Crandall to Josh Perkins – Tillie erupted a little, too. “This is my town,” you could see him say as he ran back down court, finger jabbing toward the Orleans court. You don’t even have to be much of a Zagophile to recall his over-the-top performance at last year’s WCC tournament: 72 points in three games, 13-of-14 shooting from 3-point range. For all the MVP runs the Zags have had in the tournament – from John Rillie through Matt Santangelo to Dan Dickau to Sam Dower Jr. – Tillie’s was probably the splashiest. So perhaps it wasn’t such a surprise to see him come out and drill all three of his long-distance attempts this night. But mostly, it was obvious again how much he loves to play. This sometimes seemed absent during his first return this season, at the start of WCC after a stress fracture in his right ankle had resulted in an October surgery. He simply never found a rhythm, interrupted at times by odd and unlucky fouls and at other times by the predictable rust from a forced hiatus (to say nothing of his shutdown after the NCAA tournament last spring with yet another injury). In nine games before he suffered a partially torn plantar fascia in that USF game, Tillie averaged just six points and made just 6 of 20 from the arc – but mostly just didn’t look particularly comfortable or happy. There was something different Monday night, and it didn’t seem as if just making his first 3 was it. There was a different bounce, a different energy. Tournament MVP? OK, that’s a stretch. Coach Mark Few was predictably cautious with him, granting him just three runs – 15 minutes total. 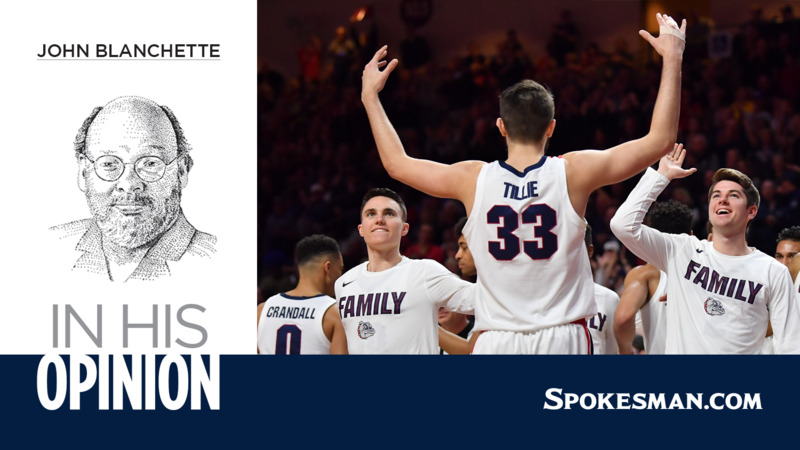 It’s been a minor regret that so much attention has been focused on Tillie’s status – because of what it means to what the Zags could be – that even just a little bit has been siphoned from accepting how good they are. That was true even against the Waves. The Gonzaga offense was remarkably ablaze – all five starters in double figures, with 26 assists on 37 baskets. Pepperdine – the happy Cinderella of the tournament – was mostly solid, and still got steamrolled. But Tillie’s return contributed to that. “He’s not just a shooter,” said Pepperdine coach Lorenzo Romar. “He’s a basketball player. He’s a scorer. He can pass and he’s very skilled. They can run offense through him. He gives them a different look than their other bigs. That’s been known to happen in Las Vegas. Killian Tillie’s kind of town. Published: March 11, 2019, 10:23 p.m. Updated: March 11, 2019, 10:49 p.m.